::K:: is a new-to-me shop that I ran across at the Men's Department. I fell immediately in love with the gothy drama of this coat, and... I'm not sure I can change my avatar for a few days. Fine, I'll just save this as an outfit. I really love how it flows -- the billowed cloth near the knee, the cowled neckline. It comes in other not-so-gothy colors too. The skin and hair are also from the Men's Department. I adore the chin on this skin! Look how rugged and manly that damned chin is -- reminds me of Brisco County Jr. (In which I reveal my age.) Anyway, I think the Men's Department is one of the best-curated events on the grid, and I'm always happy to go there. 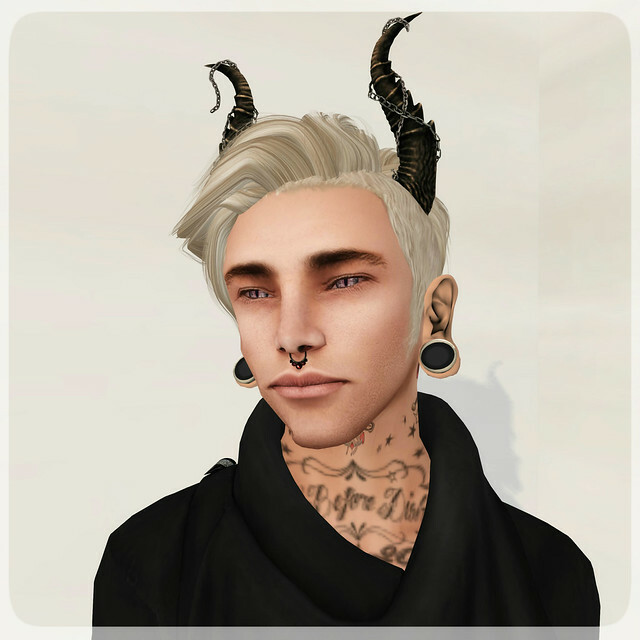 Skin: Mr. Block skin Diogo for the Men's Dept. Tattoo: [Ner.Ink] Death before Dishonor for the Men's Dept.